Companies spend a disproportionate amount of time and money trying to improve their executional competencies (i.e. manufacturing) and comparatively little energy shoring up their less tangible competencies (i.e. consumer perceptions). However, it’s often times a company’s intangible competencies that control its destiny. 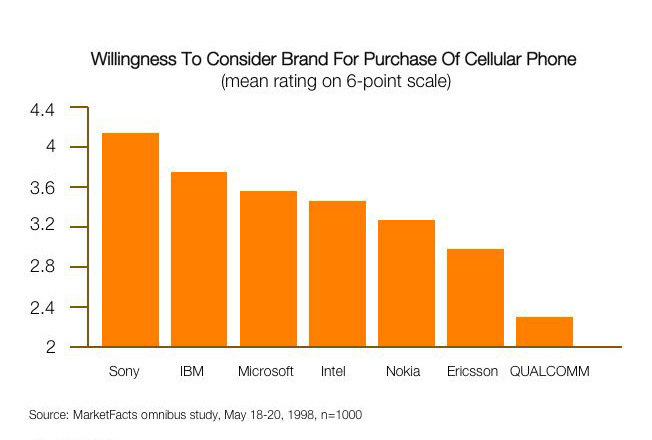 In 1997-98 Qualcomm wanted to enter the cell phone handset market. There was a lot of static in the category, with the established handset manufactures and wireless carriers investing significant sums marketing the same generic benefits: freedom, connectivity and clarity. It was a difficult environment to launch a new handset brand, but a great environment for understanding perceived competencies. At the time, the technological fight over digital standards (CDMA vs. GSM) was just beginning. Yet despite the significant technological advancements being made, consumers were already starting to see cell phones as being somewhat mundane technology. In focus groups consumers would place cell phones near landline phones on a technological continuum (the continuum would obviously look different today). From a consumers’ perspective, once most people have something, its mystique wears off. The receding technological stature of cell phones in the minds of consumers diminished the perceived competencies of the category. A prophetic piece of quantitative research done at the time showed that people were likely to consider non-cell phone brands over established cell phone brands when purchasing their next phone. (Again, remember that this was conducted in 1998). This demonstrated that broad inventive credentials trumped category specific credentials. Said another way, the more inventive a company is perceived to be, the more consumers believe that anything it makes will be really cool. Having spent enormous effort designing, manufacturing and distributing a product, it is only natural for companies to want to market its features and benefits. Consumers, however, frequently take these efforts for granted. That’s not to say that the mousetrap doesn’t matter, just that consumers’ purchase decisions are often driven by criteria other than features and benefits.